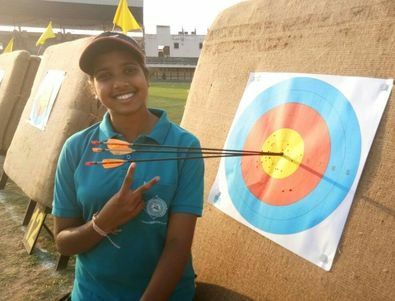 A 17-year old Madhya Pradesh archer Muskan Kirar stunned everyone by securing a gold medal for the country in the women’s compound event at the Archery Asia Cup stage 1 competition in Bangkok. Kirar has been training at the Madhya Pradesh Archery Academy in Bhopal and she was at her best since the first round of the tournament. In the final, she was particularly impressive as she got the better of Malaysia's Zakaria Nadhirah 139-136 to finish at the top podium. Kirar was seeded fourth in the compound event and managed to defeat Zhexenbinova Adel 145-142 in the round of 16 and then found things easy against Indonesia’s Yurike Pereira in the quarterfinals as she beat 148-137. However, Kirar’s biggest scalp of the tournament took place in the semi-final in which she got the better of top seed Mat Nurfatehah of Malaysia 148-144. Kirar’s victory was not the only good news on the day as she was joined by Assam’s Promila Daimary, who won the recurve gold. Apart from Kirar and Daimarv, Madhu Vedwan and Gaurav Trambak Lambe also remained successful in the tournament winning bronze medals in the women’s and men’s recurve events, respectively. While the above-mentioned stars made India proud yesterday, some also failed to overcome the hurdle and the likes of Yashwi Upadhyay, Divya Dhayal, and Hiwrale Mrinal Anil bowed out at the quarterfinal stage.